In order to love others, we have to love ourselves first; so the most important thing is to keep ourselves healthy. Exercise is one of the best way to keep us fit and healthy. Let's get active and lead a healthy lifestyle. In conjunction with World Health Day celebration, Watsons Malaysia launched its #GETACTIVE, a health initiative campaign and the good news is that Watsons VIP Card now comes with health club and more awesome rewards. As an ideal shopping place for health and beauty products, Watsons Malaysia strive to reward its members with lots of benefits through its loyalty program, Watsons VIP Card. 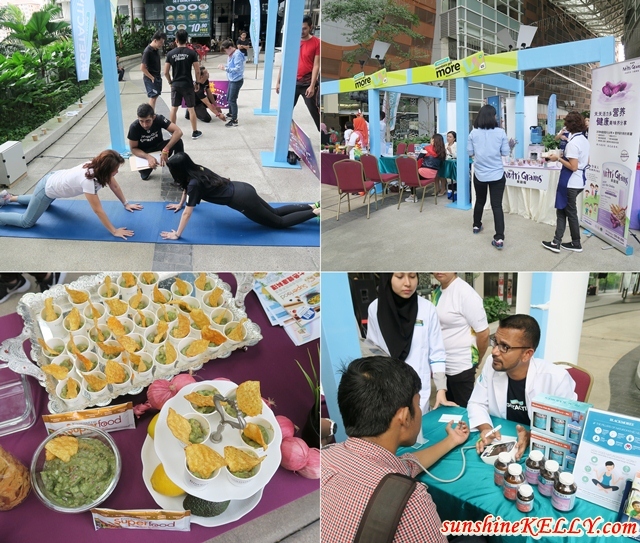 The #GETACTIVE campaign was launched at Paradigm Mall with vibrant and fun activities, health food and snacks booths and a mini fitness challenge too. During the launch, Watsons also revealed some of its #GETACTIVE ambassadors which include such as Ann Osman, Malaysia’s first female professional MMA fighter; Lenna Lim, actress and cyclist; and Kit Mah, fitness influencer. I also picked up some diet and workout tips from the ambassadors, for example Ann Osman shared with us some self-defense steps and tips what we should do when someone try to attack us or hold our neck or shoulder. Well when we exercise regularly not only we become healthier but also stronger to defense ourselves in case of unfortunate circumstances happen. The #GETACTIVE ambassadors will be having four different activities to further engage with Watsons VIP members to inculcate the active lifestyle. The sporting activities include cycling with Lenna Lim on 6th May; booth camp with Kit Mah on 1st July; self-defense class with Ann Osman on 26th August and futsal with Mark O’dea on 30th September, 2017. Interesting isn’t it? We can’t wait to join these activities too, so don’t forget to get your Watsons VIP card. In the nutshell, Watson VIP Card now comes with health club rewards and more than 1,000 #watsonsrewards merchant locations. For new Watsons VIP Card sign up, you get RM300 worth of Watsons vouchers, receive 500 VIP Points upon activation and RM5,000 worth of health club, dining, travel, beauty, and lifestyle reward vouchers. It’s so worth it right… and as a Watson VIP member you can participate in #GETACTIVE activities and classes too. So hurry get your Watson VIP card and activate them now. I have a Watsons card as well. Wonder if it's the same one and if I can benefit from this health rewards. self love is the most important thing one should learn and understand. everyone should participate in such kind of campaigns. Appreciated! Looks like a great event, I just gotten my vip recently will fully utilize it.